The paradox of the International Monetary Fund (IMF) is that it has been around for so long and is so familiar a part of the institutional apparatus of the global political economy that we can easily think that we understand what it is and how it behaves. After all, was it not responsible for bringing to bear a series of tough ‘structural adjustment’ packages on ‘Third World’ countries in the 1970s? And was it not one of the main sources of neoliberal thinking and policy enforcement across the whole world in the 1980s and 1990s and indeed ever since? What else do we need to know? This leopard has spots. Well, the answer is actually an awful lot, according to Ben Clift, Professor of Political Economy at the University of Warwick and Honorary Research Fellow at SPERI. In a truly excellent new book Clift takes as his starting point the fact that the importance of the Fund’s role in global politics and political economy is ‘often misconstrued – either overstated by those critics who see the IMF as imposing its will on poorer borrowing countries, or understated by those seeing the IMF as simply a conduit of the interests of its powerful rich members who sit on its Board’ (p. 88). Thereafter he works his way towards a fuller and much more nuanced understanding of the Fund – showing beyond doubt that that there is never such a thing as The Fund in the singular – by exploring in detail its dealings with advanced political economies, and thus its role in the politics of austerity, in the decade since the global crash of 2008. Clift is a ‘constructivist institutionalist’ by methodological inclination. He develops in his book an arresting account of how what he calls IMF ‘bricoleurs’ craft new ideational positions on policy questions of concern to the Fund by recombining innovatively different elements in their repertoire and thereby, as he and other constructivists put it, ‘“layering” new ideas over old’ (p 7). From this perspective there inevitably remain limits to what they can think, say and do. According to Clift, Fund staff members feel a strong need to relate their new thinking to former Fund positions and do not generally seek to gain credence for their developing ideas by claiming to break decisively with past policies, as is often the way in politics. Also, they look always to connect their positions to ideas and theories within mainstream academic economics (and here Clift is right to emphasise that the mainstream in economics is broader and more diverse than is sometimes claimed by its critics). Who are these ‘bricoleurs’? Seniority matters in the IMF and so the most important – although not exclusively so – are the Fund’s Director and its Chief Economist: namely, in the period under study, Dominique Strauss-Kahn and then (from September 2011) Christine Lagarde; and Olivier Blanchard and then (from September 2015) Maurice Obstfeld respectively. Clift treats these key players as political actors within the global political economy and shows that at many vital points in the endeavour to address and recover from the 2008 crash they made a difference (for the better) to the choices and decisions taken by Group of 20 (G20) heads of state at their summits and in their own national policy-making processes. It’s clear, for example, that it mattered that at the moment of crisis in 2008 Strauss-Kahn saw instantly the need for collective counter-cyclical fiscal activism and was able to press this case upon governments as the IMF’s position. It mattered too in another example that as the crisis wore on Blanchard worked consistently to re-assess within the Fund the effectiveness of fiscal multipliers and generally to open up discussion of the important notion of fiscal space. Clift is careful not to exaggerate the implications of these inherently political moves. He says only that they ‘strengthened the market-sceptical, Keynesian “sub-culture” within the Fund’ and ‘bolstered an interpretive framework focused on post-crash deficiencies of aggregate demand and crises of confidence’ (p.10). What he is arguing here is that, importantly, Strauss-Kahn and Blanchard succeeded in framing the crisis, at least at this early stage in its evolution, as a ‘crisis of growth’ rather than a ‘crisis of debt’. Impressively too, when this interpretation came under political attack from the push back against Keynesianism and towards fiscal consolidation at and after the 2010 Toronto G20 summit, the arguments for proactive use of fiscal policy were not abandoned by the IMF, but reiterated repeatedly, albeit sometimes subtly, in its research papers, its regular reviews of the World Economic Outlook and many other statements. Clift cites many Fund staff members saying to him during the course of interviews he undertook in Washington as part of his research that they were strongly motivated by a desire to see the Fund vindicated as being on ‘the right side of history’ in the crisis. Although it should be noted (as Clift does) that the Fund’s deployment of the idea of fiscal space was limited by its willingness to deem that in fact some countries had no fiscal space within which to move (think Greece here), my reading of the account presented in this book of the Fund’s complex behaviour during the last decade of crisis suggests that this has broadly been the case. The Fund had as good a crisis as anyone could reasonably have hoped. And yet… The qualification necessarily comes because, as we know only too well, the actual story of the political economy of the years 2008-18 has been austerity. The Keynesian moment was no more than a moment. In the final analysis, the IMF, even with all of its many influential ‘bricoleurs’, was not able to win the battle of economic ideas against the standard ‘crisis of debt’ line emanating from 2010 onwards from a powerful coalition of the German and United Kingdom governments, the European Commission and the European Central Bank. In these unfavourable political conditions, the IMF’s activist and at least broadly Keynesian policy ideas could not gain enough ‘traction’, which is the term that IMF staff members themselves use to describe their level of influence on the domestic policies of the advanced economies. As Clift concludes, those who like to decry the IMF as excessively powerful and/or acting largely as the agent of the United States ‘underestimate all we have learned about Fund autonomy, and its ontological independence’. 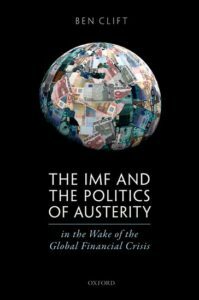 Nevertheless, he goes on, ‘the IMF cannot sustain a policy position diametrically opposed to all its major shareholders’ (p. 223). In sum, then, the real intellectual gain that we can derive from reading Clift’s new book is a better understanding not just of the ways in which the IMF can wield ideational power but above all of the limits of its capacity to govern the global political economy.